Don't wait to get cheap loops in the mail. We offer instant download on our loops sets. This hip hop loop set contains 5 different beats made up of over 25 loops. This enables you, the producer, to use just the drums, or just the melody. You are also able to take certain parts out to build the structure of the song you are creating. There are 5 beat folders in this set and each individual element of the beat is within these folders (example below). You will get the drum loop and all melody loops separately so that you can modify the beat to your liking. Build verses and choruses where you want! You can also just use the beat and write your own melody to it, or just use the melody and write your own beat to it. All loops are in .WAV format so they will work in most common samplers such as: Reason, Fruity Loops, Acid, etc. These loops are 100% Royalty-Free! 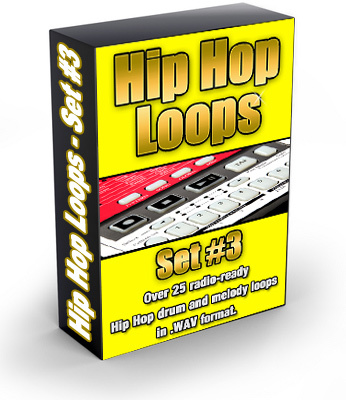 Hip Hop Loop Set 3 2158295 6.95 loopsellers Fresh Download Available!